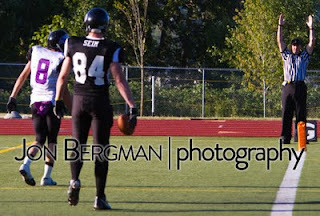 The Bellingham Blitz faced off against the Renton Ravens in the semi-final round of the Western Washington Football Alliance Championship Playoffs Saturday, July 30 at Civic Field. This was a rematch from a game played in June that resulted the Blitz serving the Ravens a 70-0 defeat. Renton had recently strengthened their defensive front seven and were ready to take on the Blitz bruising ground game. Bellingham started out strong, moving the ball quickly down the field in the first quarter. But the Ravens defense stiffened as they drew closer to the red zone and held to Blitz to a field goal. Bellingham hit their stride in the second quarter as two end zone frequenters wide receiver Toby Seim and running back Vann Vetch exploited weaknesses in Renton's defense. The second half turned into an aerial display as quarterback Leon Lilley connected with Seim and quarterback Cody Oakes for three more touchdowns. Final score 47-12. Click here to view photos from the game. The next game will be for the WWFA Championship and will be held at Civic Field August 6.